La Citta Alta and i Giardini di Villa Melzi will appeal to history buffs. Let the collections at Il Vittoriale degli Italiani and Chiosco Villa Carlotta capture your imagination. 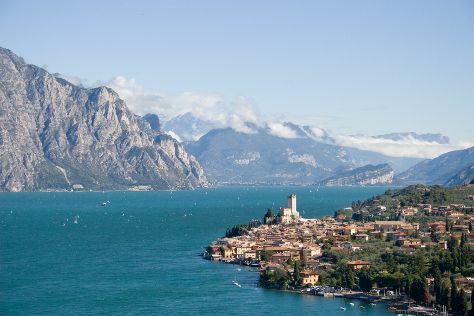 Venture out of the city with trips to Palazzo Comunale (in Clusone), Lago di Garda (in Garda) and Sirmione (Grotte di Catullo & Rocca Scaligera di Sirmione). Spend the 14th (Thu) on two wheels at Anything But Work. There's still lots to do: enjoy the sand and surf at Spiaggia Tranquilla, gear up at Varenna Rent a Boat, choose your vessel at Lake by Boat - Bellagio Boat Rental, and examine the collection at Museo Etnografico E Naturalistico Val Sanagra. For ratings, more things to do, maps, and tourist information, you can read our Bergamo holiday app . If you are flying in from Portugal, the closest major airports are Malpensa International Airport, Il Caravaggio International Airport and Milano Linate Airport. Expect a daytime high around 10°C in February, and nighttime lows around 2°C. Finish your sightseeing early on the 7th (Thu) to allow enough time to travel back home.